THE lack of paper, meatless meals and complete recycling of waste, were refreshingly different, though not everyone appreciated the paperless culture. It’s a while to go before squinting at a small screen becomes the norm. The absence of pop up banners and local branding was also refreshingly more soothing for the eyes. Singapore does have a culture of putting people in a deep freeze. Not having to shudder in ridiculously cold temperatures in this equatorial country, because the air-conditioning was for once, not making things intolerably cold, was a delight in itself. I was still not expecting an event with a low ecological footprint. The ambitious agenda of Singapore’s Marina Bay Sands’ first-ever ‘Zero Waste to Landfill’ event promised just that. The Responsible Business Forum hosted by the United Nations Development Programme and Global Initiatives involved over 600 international business, government and NGO leaders inviting them to engage with the UN’s Sustainable Development Goals in at MBS from 22-24 November 2017. It was easy to take the remarkably efficient and cheap Singapore metro directly from the airport to Bay Front. While going up the event on the 3rd floor, you could see the boats parked at the ground level, right in the middle of a shopping mall. One could pretty much buy anything one wanted in the mall — from Shiatsu massage machines to hot steamed Dim Sum. Consumerism in all its forms. Up on level 3, amidst other corporate meetings and seminars, a very different message was being sent out in the RBF. The carbon footprint of over 600 high profile individuals, senior government officials, UN agencies, and some of the world’s largest NGOs as well as media professionals gathering from all across the globe was estimated to be 320 tonnes. How much of that could be offset by avoiding paper handouts and eco friendly food, could be debated, but reminding people constantly that habits had to change if change was to be had, was not a bad one. Even the grumpy responses to not having paper, did bring up the topic. At the briefing before the unveiling of the innovation champion of UNDP, we were kept on tenterhooks. It was going to be a celebrity for sure, but who would it be? Some thought it might be Miss World, or some popular film star. All the organisers gave away was that it was a ‘she’. Some of us did suggest a robot, but quickly went ‘naa’. It was sure to be a flesh and blood person the audience would go gaga over. The need to let us in on the secret was a functional one. We had to select who was to ask the questions, which questions, and in what sequence they were going to be asked. 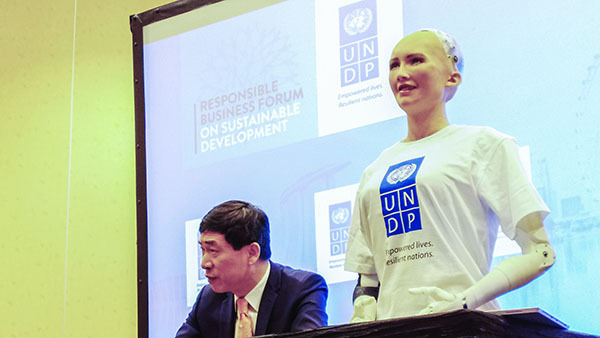 The idea that Sophia the robot was a symbol of artificial ‘intelligence’ was soon dispelled. This was a mechanical parrot being taught what words to mimic. Again, it would be churlish to throw out the baby with the bathwater. This wasn’t about Sophia, but what she represented, and stage-managed press conferences and spin-doctors were nothing new to journalists. It was the post briefing grilling of a UNDP spokesperson that showed how little things had been thought through. Journalists being what they are, a reporter, in need of a soundbyte, asked the UNDP guy, ‘So is she a UN ambassador?’ ‘Er, no, he replied, she is an innovation champion.’ ‘Is she a first?’ she pressed on. He wasn’t sure. Sophia herself had hardly been impressive. She was only waist up. She was clearly mechanical and not particularly eloquent, despite having only been asked pre-set questions. It was however a good photo-op and inevitably there was a queue for selfies with Sophia and she happily obliged. She even tried telling jokes. There is an advantage in having a robot representing you. She can be the perfect, albeit predictable spokesperson. Later when Sophia met Sheikh Hasina, the prime minister of Bangladesh, Sophia could just as well have been carrying an Awami League membership card. Praise for the prime minister, her father and even the reference to the ‘Mother of Humanity’ is something a real ambassador would have been embarrassed about saying quite so blatantly. A pre-programmed Sophia had no such qualms. There were other aspects to the event. The new documentary about Sustainable Development Goals in PNG ‘Driving the Change’ and the film on Maldives ‘Save our ocean’ both well-produced films, looked impressive on the big screen. The elderly people, the investors from Silicon Valley and the inquisitive youth, made an interesting mix. But in the end it was about economics. Globally 60 per cent of GDP is attributed to business. So businesses simply can’t be ignored if changes are to take place, though what GDP takes into account and what it fails to register, might in itself have been a topic of debate. As one speaker mentioned, ‘How do we get businesses thinking beyond dollars and cents?’ That perhaps is what the SDGs are about. Partnership was a buzzword throughout. Partnership for what, remains the question to be asked. But if we accept the statement that closing the gender gap by 25 per cent would add 5.8 per cent to the global economy, a smart business mind would hopefully sit up. What the event clearly provided was a networking opportunity, and potentially, the building of relationships, but as one of the speakers pointed out, ‘relationships are built at dinners, around campfires while playing games together’. It was good to see youngsters and elderly people playing games, building things, having fun. Nerds like me enjoyed the virtual reality displays. In the end, whether mega events such as this represent money well spent, will depend upon the actions they stimulate and not the rhetoric from podiums. Sophia and the delegates who gathered need to do more than provide the right responses at press conferences. They need to shed tears, get angry, pump air in excitement at finding solutions for humanity. If the RBF even partially catalyses that transformation, it will have been worthwhile.